Tag Archive | "foreign aid"
On November 9, 2013, panelists of the 45th Annual Sutton Colloqium discussed how energy plays into economic development and sustainability in developing countries, which comes at a time when many doubt the attainment of the Millennium Development Goals (“MDGs”) by the 2015 target date. The MDGs aim to eliminate extreme poverty and hunger, provide universal primary education, support gender equality, increase maternal health, decrease child mortality, fight devastating diseases like HIV/AIDS, all while promoting sustainable environmental development and worldwide cooperation for development. As the panel’s moderator Professor Lakshman Guruswamy pointed out, the MDGs do not specifically mention energy, but energy is necessary to accomplishing each goal. With about 17 percent, or 1.2 billion people, lacking electricity, however, how are these citizens, mainly in Africa and Asia, to access electricity and sustainably develop? 1. By requiring citizens of developing countries to personally invest in the solar panels from which they benefit on their homes or businesses, OBA lessens the pitfalls of traditional, input-based foreign aid, which Dambisa Moyo has criticized as a disincentive for developing countries to do just that – develop. 2. Because the poor must develop to rise out of poverty, development that inherently implies consuming resources and emitting gases that negatively impact climate change and health, OBA for rooftop solar incentivizes the use of a renewable, emission-free energy source. Some specific OBA projects can be found in these countries: Philippines, Cape Verde, Sri Lanka, Bolivia, Cambodia, Ghana, Honduras, Indonesia, and Zambia. 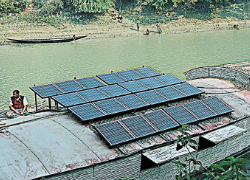 The Bangladesh scheme is globally revered as “one of the most successful Solar Home Systems (SHS) programs.” As United Nations Secretary-General Ban Ki-moon declared, the UN has a goal of “sustainable energy for all by 2030,” because “[o]ne out of every five people on Earth lives without access to electricity [that provides opportunities] for working, learning, or operating a business.” Also, about three billion utilize methods of cooking and heating that affect health and emissions that contribute to climate change such as wood, coal, and animal waste. “[C]ontinu[ing] to burn our way to prosperity” is not an option. OBA, and hopefully Power Africa, represents a viable solution for how the poor may rise out of poverty through increased access to electricity and sustainable development.